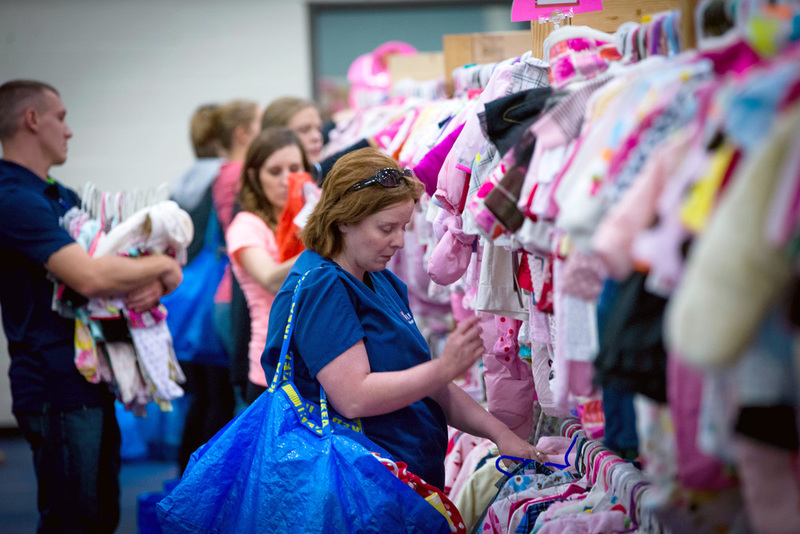 One Week Boutique is held twice per year at the Champaign Park District's Leonhard Recreation Center, next to Sholem Aquatic Center. Our spring/summer sale is typically held in April, with the fall/winter sale usually occurring in September. One Week Boutique is held at the Champaign Park District's Leonhard Recreation Center right next to Sholem Aquatic Center. We gladly accept cash, check, MasterCard, Visa, and Discover. Photo ID must be shown with all check or credit/debit card purchases. One Week Boutique pre-sales are special private events for consignors, volunteers, first-time parents, and 100 prime time ticket holders to have an early opportunity to shop our event before the general public. Everyone is welcome to shop at One Week Boutique during our public shopping hours. We ask that no outside bags, carts, baskets or racks be brought into the sale. Strollers are allowed at the public sale but we ask they not be brought to the pre-sales. Strollers are allowed at the public sale. We have new large shopping bags for your convenience, so outside baskets or bags will not be permitted. Children are welcome at the public sale but please use good judgment when you bring them. It is very busy and sometimes a bit chaotic and little ones underfoot may get into places they shouldn't. This is a perfect opportunity to give yourself some alone time and enjoy a day shopping. It’s always a good idea to bring your child's measurements and a tape measure to measure the items. A tip for buying shoes at One Week Boutique is to trace your child’s foot on a piece of cardboard or sturdy piece of paper, cut it out and bring it to slide inside a shoe to see if they fit. Children are not allowed to play with toys at the sale. Items are the property of consignors and if they are broken or separated they cannot be sold. This will be strictly enforced. Also, please do not allow children to play or climb on racks. Children are not allowed at the pre-sales unless they are in a front or back carrier and attached to an adult at all times.